“Yes sir, do not worry one bit. 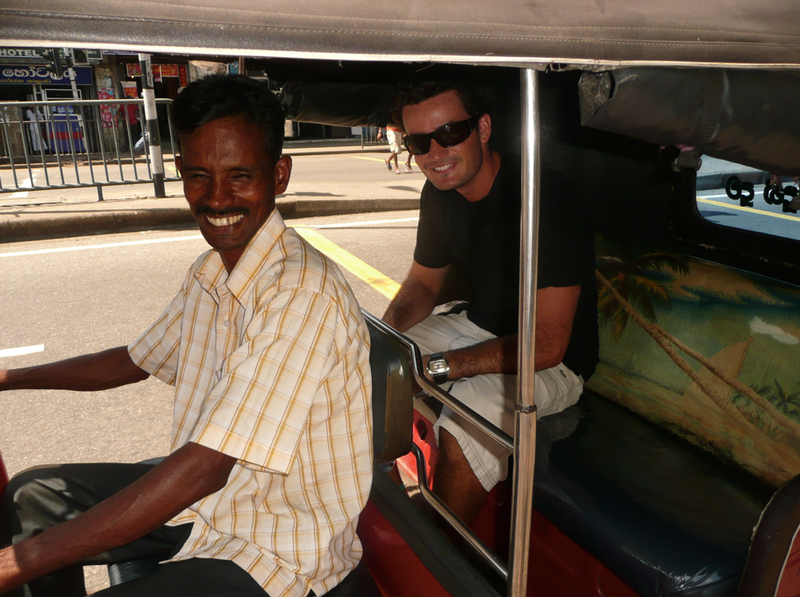 My auto-rickshaw is the safest in all Colombo.” Who could argue with a claim like that I thought to myself as I climbed into the back of the smiling man’s three-wheeled death trap. As he started the rattling engine, smoke poured out of the back as the metal shell I was now enclosed in shook to life. As he took off down the crowded street, weaving in and out of traffic without the use of an indicator or without even as much as a glance over his shoulder, I looked into the rear-vision mirror at the man who was still donning the same smiling expression. Holding on with one hand while trying to keep my long legs and knee caps in the confines of the rickshaw and out of harms way, I hollered for the man to slow down. The only response I received was another smile and an odd bobble of the head from side to side as he pulled the throttle back once more to blindly overtake a double-parked truck. There are times in life when it is just best to sit back and accept that what will happen, will happen. This was one of those times. Sri Lanka, a tear drop in the Indian ocean. The off-shoot in the shadow of the sub-continent. The man whose smile haunts me to this day. I visited Sri Lanka a few years ago on the way home to Sydney after a year and a half traveling through Asia, Europe, North America and glorious Mexico. The idea behind the stopover in Sri Lanka was to get a bit of sun en-route to an Australian winter and a 9-5 office job (I know right, why the hell would you swap traveling Europe for a life of sitting in an office chair!). I had visited India some years earlier and had a pre-conceived notion in my head of Sri Lanka being similar to the madness of India, just with fewer people. 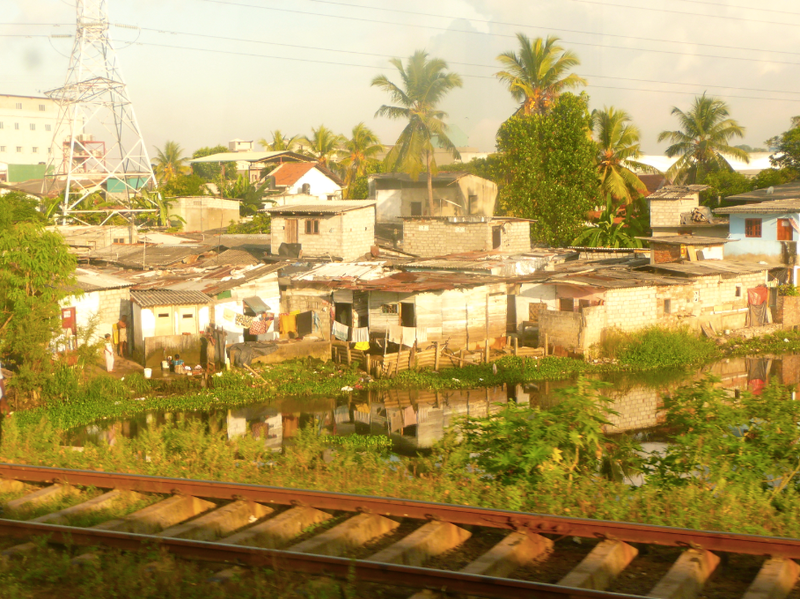 To a point I was on the right track, but I was also a long way from imagining the reality and beauty of Sri Lanka. Arriving in Colombo after a 15 hour flight with a certain budget airline, with no food or entertainment to speak of, I was hungry! Once we dropped the bags off, the curry lover and chilli fanatic in me took over and saw me ordering the hottest curry on the menu from a busy roadside curry house. Note to anyone out there considering a scorching hot curry on an empty stomach: think twice before repeating my error… After recovering from the torture that followed, we ventured out into the streets to do a bit of sightseeing. This is where I met the smiling auto-rickshaw driver. After a day or so in Colombo, the urge to see something new and get out of the city took over, so we made our way to the main train station and purchased two one-way tickets to Kandi, the in-land capital of Sri Lanka. The scenery while traveling into the mountains in Sri Lanka is second to none. The slow-moving train wound its way around mountains and through villages that would be missed if you closed your eyes for only a few seconds. Some parts of the journey see the old carriages clinging to the mountainside as tea plantations pass you by. 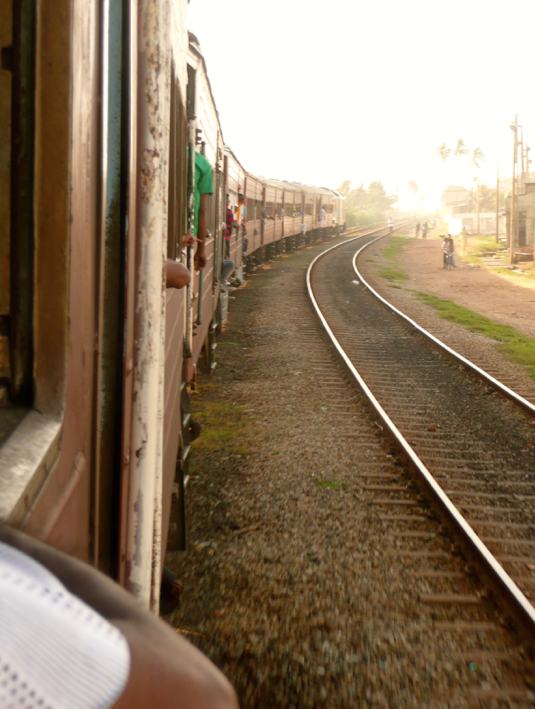 Train travel offers an insight into a country like no other form of transport. If I have to be honest, Kandi didn’t do much for me. It was busy, hot and a long, long way from the coast. My most vivid memory of Kandi was the son of the lady who ran the guesthouse in which we were staying. He had two thumbs on his right hand. A fact I was only made aware of upon shaking his hand and looking down at his grasp due to something feeling amiss! After a couple of days visiting different sites and The Temple of the Sacred Tooth Relic, we hired a driver to b-line us down to the coast in search of cooler weather and a swim. 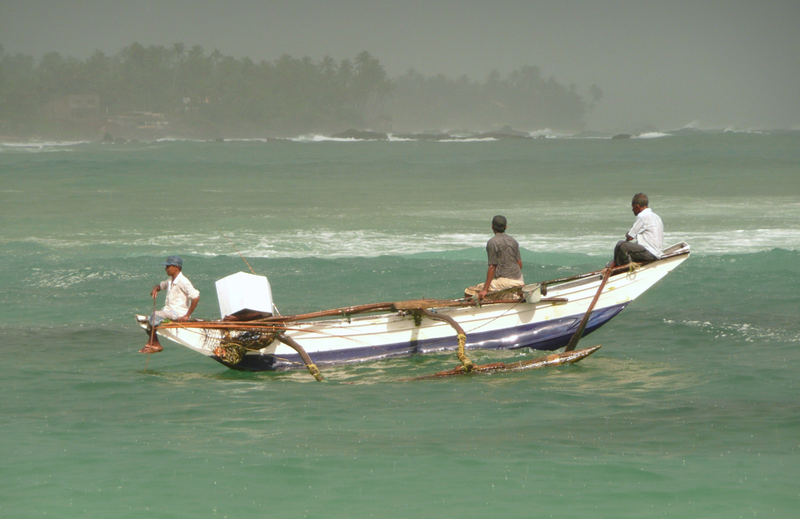 The southern coast of Sri Lanka is the kind of place that you envision when you think of traveling to an island nation in the Indian Ocean. It is laden with palm trees, beach shacks and fishing villages that offer great photo opportunities and some amazing food. Like so many villages in Sri Lanka, the resort town of Unawatuna was destroyed in the 2004 Boxing Day tsunami and has been rebuilt from the ground up. In the rush to secure the best beach-front views, the authorities didn’t set out guidelines for the rebuilding and unfortunately numerous hotels have been constructed so close to the ocean that some are falling into it! I spent a very happy 27th birthday in this little town, swimming in the Indian Ocean and eating roti and curries until I could eat no more. 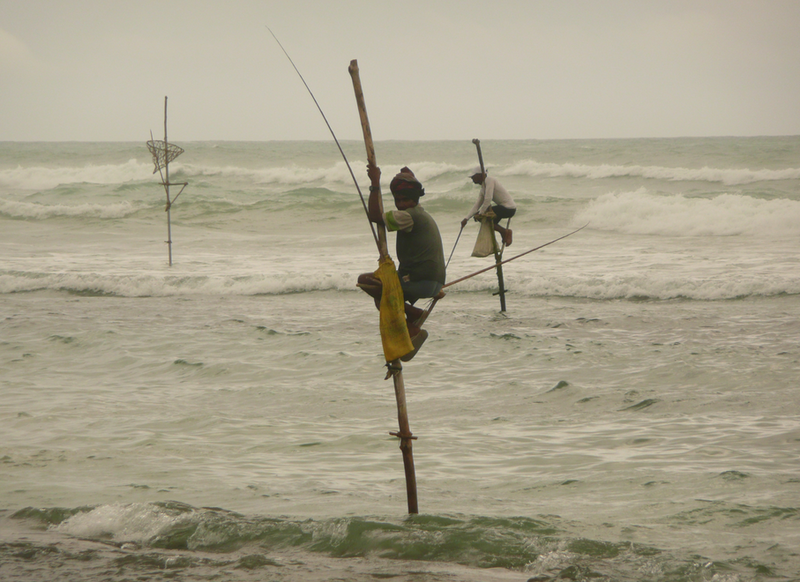 Before arriving in Sri Lanka, the goal was to reach the east coast of the country and spend a day or two in Arugum Bay but time got the better of us, for you see travel is a long and arduous process in Sri Lanka. The roads are rough and the rail network is primitive. What seems like a short distance in western terms can take a full day or even more to travel. 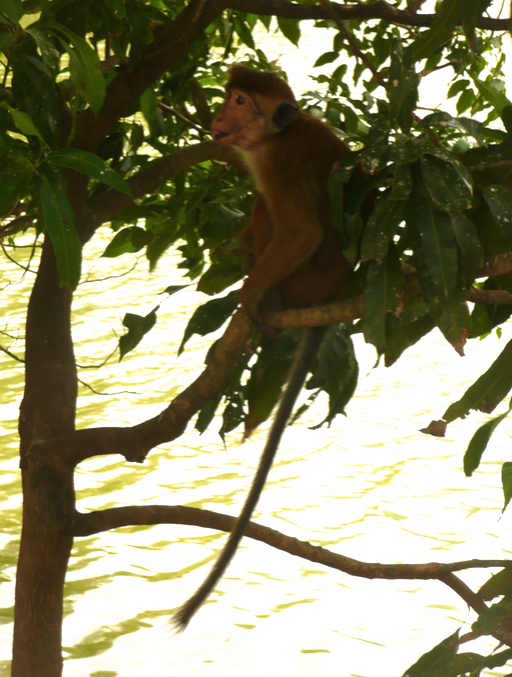 But I think this adds to the charm of Sri Lanka. It is hard to travel from one place to another in a short period of time. This alone is enough to keep a lot of people away. 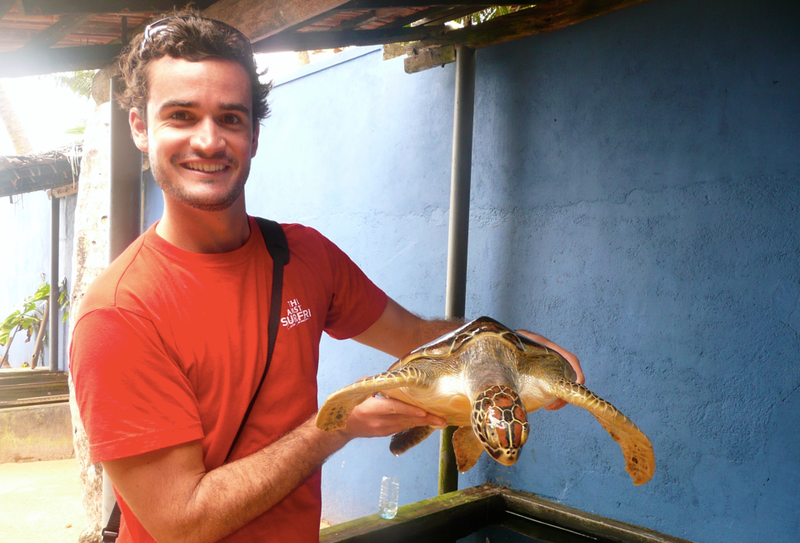 I only spent a week in Sri Lanka and feel that I have unfinished business there. I often find myself thinking back to the food and people I met while I was there. I give Sri Lanka “three thumbs” up and recommend a visit to anyone who is looking for a relaxing travel experience that also offers a lot in the ways of culture and food. Plenty of t-shirts. The humidity will have you going through a few shirts a day! You are in an auto-rickshaw hanging on for dear life while the driver smiles and ignores everything you say. 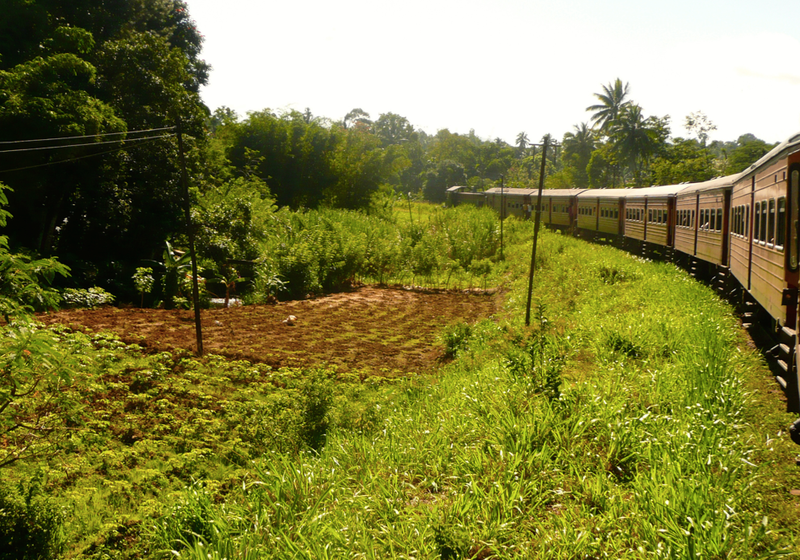 Slow and steady wins the race on the Sri Lankan railways. 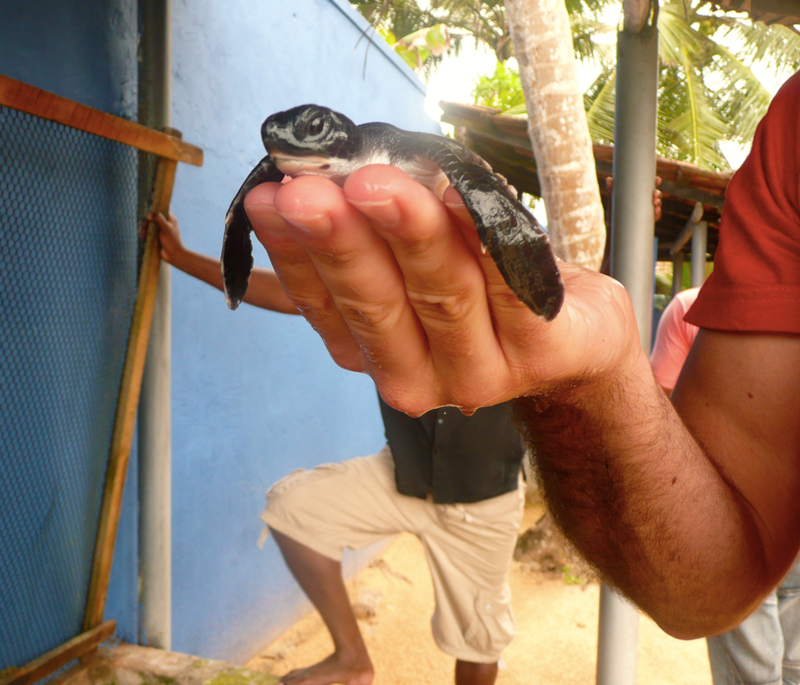 Sea turtle breeding program in southern Sri Lanka. 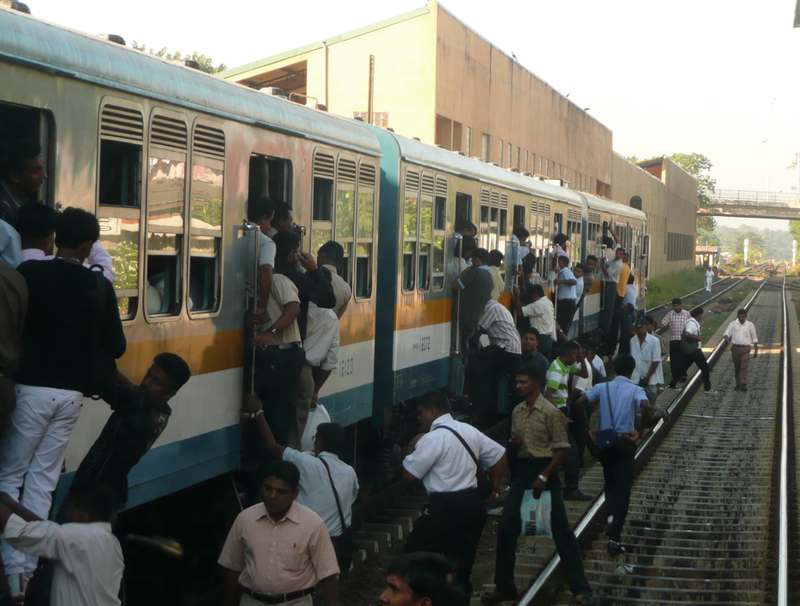 All aboard the 5:20 to Colombo! 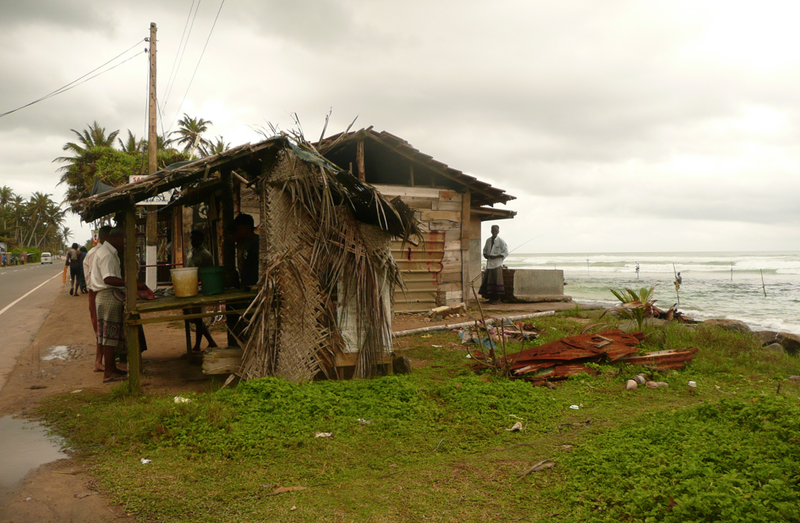 Living the simple life in a fishing village. This little fella was heavier than he looks. Hi, I am glad you enjoyed the post! I often think back to the 5 minutes of terror and laugh to myself. Ah the trains in India..I had a very similar experience to you in Delhi once. As the train was rolling up to the platform, people began throwing their belongings and children into the open doors of the moving train! It is something I’ll never forget! You’re welcome. Glad you enjoyed the read!